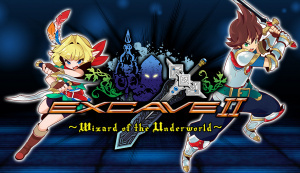 Not long ago, the budget-priced dungeon-crawler Excave hit the 3DS eShop, and our review found the experience a technically sound and overall enjoyable experience, despite some minor flaws. This sequel follows a bit more than a month later, and promises more polished hack and slash gameplay, though at an increased price; the question is whether Excave II: Wizard of the Underworld builds upon its predecessor in the right ways. Just like in Excave, the story is presented to the player sparsely through scrolling text (which can be skipped altogether), and yet again mysterious creatures are terrorizing our heroes' home of Castle Town. However, Excave II forgoes the original's storytelling mechanic of collecting papers in dungeons which reveal cryptic parts of the narrative while taking up inventory space, and instead opts for placing NPCs at the end of certain dungeons who reveal (some more successfully than others) exactly what's happening. This change is admittedly a small one, but is very welcome. Otherwise, most of the narrative is still largely bare bones and somewhat banal, and the story doesn't really resolve itself in an interesting or compelling way, just as in Excave. 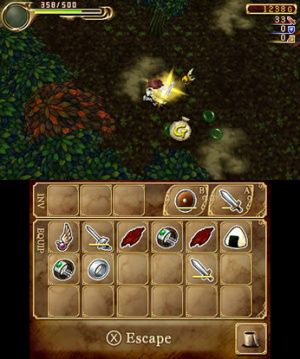 Gameplay-wise, the experience is almost identical to that of the original's. Players will still fight their way through dungeons using one of two playable characters, fighting enemies in real time, collecting mystery weapons to be appraised back at the blacksmith's shop and taking down bosses. 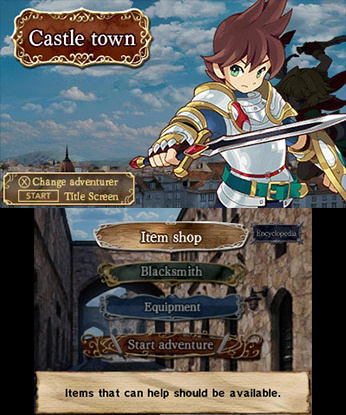 There's still the option to escape the dungeon at any time using the X button, and falling in battle will still return players to Castle Town while stripping away any un-appraised items and one randomly selected piece of equipment. There are some nuanced changes made to the formula, however. Instead of paying gold to appraise mystery items, now they will be automatically appraised upon either completing or escaping the dungeon (but again, not if your HP reaches zero). This change is welcome, as it frees up (now much more readily available) funds for better uses such as buying health potions and antidotes, as well as new kinds of consumable items which come in quite handy whilst exploring. One such item allows for instant appraisal of a mystery weapon or equipment in the dungeon, which is a very helpful option. One of our biggest complaints in Excave was the frustrating inventory management, and the introduction of items that make such management easier is a delightful change. In addition, the size of the inventory was nearly doubled, so it seems developer Mechanic Arms was mindful of the need for more space. The combat is completely unchanged, and much like in Excave the difficulty is sometimes inconsistent. There were enemies that both challenged us and bored us, sometimes within the very same dungeon. That being said, a good number of enemies require more than just mindless A-tapping to defeat. 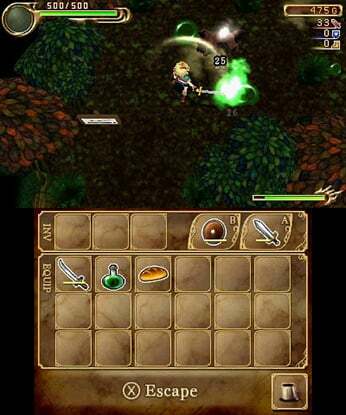 Another improvement is that healing items and food can now be used without use of the touch screen, which makes healing in the heat of battle much easier. One of the things that Excave did very well was constantly introducing players to new and gratifying weapons. Fortunately there is now even greater variety in weapon type and strength, which makes collecting stronger weapons very rewarding. There are weapons that increase certain stats, weapons that have elemental properties, and weapons that allow for a number of strategies against enemies and bosses. Noteworthy is that there is no leveling system here in Excave II, and instead player stats rely entirely on equipped items and weapons. The equip items are more plentiful this time around, and in greater variety, so optimizing stats strikes a balance between elementary and diverse. Diversity is also present in level theme and design, which is a very refreshing change. Rather than the stiff, generic visual style that seemed to permeate the levels in Excave, we adventured through forests, sewers, castles and more in this sequel. The navigation of dungeons has improved as well. Instead of one large dungeon which is entered from the same point each time, levels are now selected from a menu; this cuts down on the tedium of traversing empty corridors just to get to the newest level. Several menu assets and weapon sprites seem shared between Excave II and its predecessor, but nearly all of the enemies and bosses are brand new. The music is still inoffensive and nice to have playing in the background, but the tunes aren't the catchy kind players will find stuck in their heads when the adventure is over. One problem we found with Excave II is actually a combination of two things: game length and the launch price tag. This is a lengthier adventure than its predecessor, but not by too much. Players who completed the original game could likely clear this campaign in a couple of sittings, which makes the decision to charge double the price a tad baffling. Part of the appeal of Excave was its low price tag, which made it a very nice experience for those looking to try dungeon crawling RPGs, and the length was reflected by the low price. Here, however, players are being asked to pay more for an experience that's not much meatier than the original. We suspect that the increase in price may have something to do with the series changing publishers, but the outcome is unfortunate nonetheless. Paying just a bit more for the improved mechanics would have been reasonable, but increasing the price so much for seemingly liitle reason doesn't make very much sense. Given the fact that Excave II made changes in all the right ways, it seems a shame that the increased price could prevent some from enjoying the experience. Excave II is a safe sequel with shares a lot in common with its predecessor, but with some very nice refinements made to the formula. Inventory management is much easier, using healing items while fighting is no longer a dangerous affair, and the variety in environments and weapon types has expanded even further. Though in some ways Excave II feels too similar to the original game, this is to be expected from games developed in rapid succession using shared assets. However, the higher price tag is immensely confusing given the fact that the length of the game is similar to that of the first one. That being said, the game itself is a mechanically successful sequel which improves upon its forerunner; Excave II is a quality experience that doesn't quite last long enough, and one couldn't be blamed for waiting for this game to be discounted before buying. I haven't even got to the first one yet then alone worrying about how Well this one scored. The releases are far too close and might hurt the sales of the first. I'm not really interested in either game but if I were I'd skip the first and just go for the sequel, considering the improvements. It also makes the relative prices less of an issue. This looks pretty neat. I'll probably pick it up. I was interested in the first, but never got it, so this will do. I will wait for discount if it gets a discount. The game looks good but my backlog is just too big to pick this up. A discount would lure me in though. I definitely think I will be waiting for a price drop if I do get it at all. Not too big on dungeon crawlers right now. Haven't even got the first one, I'll probably pick both of them up on my next trip to the E-Shop. I'll eventually pick up Excave considering it's only $5 on the eShop. As for Excave II, depending on how much I like/dislike the first game.. Which, I'll probably enjoy it. I like dungeon crawlers for the most part. Thought it was a first person dungeon crawler at first when I read the first line in this review. Sadly it was not to be. It's also from a different publisher, for some reason. @Morpheel If I had to guess, I'd say Teyon wasn't terribly pleased with the sales of the first one over here in the west, so they dropped the sequel. Then Bergsala Lightweight misread the situation and went and charged double when they should have kept the low price of the original. @GiantBreadbug I guess, though both games came out in quick succession, so I don't know if Teyon even had time to be dissatisfied with the sales. Well I cant get the first knowing the second is better but its double the price and not double the fun. I wont get either then till the price goes down on this one. I waited for this to go on sale. It's on sale for $5 and I bought it, finally. So far, not bad. Based on the reviews, this version is much better than the original in terms of larger inventory, better dungeons, etc. Sure, it's a simple game but at a price that makes it akin to picking up a Nintendo made streetpass game, this gives you a pretty decent dungeon crawler at about the same quality and none of the annoyance of having to streetpass people to play. Had Nintendo made it, it would get more coverage and I'm sure you'd see a lot of praise for it proclaiming it a great value. So far, I'm at the city section fighting rats and slugs. I have already found some cool weapon drops and exclusively playing the male warrior because I like his weapon types. The magic types in this game are well animated, not to mention the elemental system extends to your swords and bows, so you can hit weakness with or without focusing on magic if you would rather equip a shield. I say give it a try. I'd love if it had a way to customize weapons; something like Dark Cloud 2's weapon customizing would be both familiar and addictive. Sadly, the blacksmith seems so far to only allow you to repair what you find in dungeons, not actually make a weapon to your liking. EDIT: The Underworld Tower (unlocked upon completing the main game) really makes this game so much better. It ups the challenge considerably and forces you to rethink how you play the game even. You still do the basic mash A stuff but you have to switch weapons far more often to take advantage of elemental weaknesses, you have to manage your health with HP drain more, you have to shield effectively almost every step of the way, etc. It's a great mode if the main game seemed too simple in challenge. It also more than doubles the length of the game because you will progress pretty slowly through this extra mode (as you learn how to deal with the extra challenge). I just unlocked a sword called Earth Sword for getting 260 items in my Encyclopedia.